Jordanian Prince Ghazi Bin Talal praises the "courage" of the Pope to take decisions against the stream such as the liberalisation of the Latin Mass. The exponent of the Hashemite royal house has welcomed the Pope in front of the al-Hussein Bin Talal mosque in Amman. Having thanked Benedict XVI for the "clarification" provided by the Vatican on the controversial 'lectio' of Regensburg and have pointed out that the figure of Muhammad is "completely and totally different" from the image given of it in Western historiography, the prince stressed that the pontificate of Ratzinger has been "marked by the moral courage to give voice and stay true to his own conscience, whatever the fashion of the day." 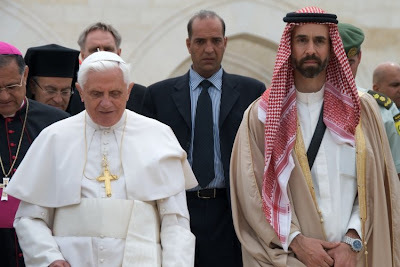 More specifically, Ghazi Bin Talal recalled that Benedict XVI has written "historical" papal encyclicals on love and hope, has promoted interreligious dialogue and that "he liberalised the traditional Latin Mass for those who adhere to it." Thanks to the Papa Ratzinger blog. An English translation of the entire, quite remarkable speech is now available at Sandro Magister's site.